As a dietary supplement, empty one packet directly under your tongue and allow it to dissolve for 3 mintes. Use 1-3 packets daily, as often as every 4 hours, or as directed by a health care practitioner. For optimum absorption we recommend you take ProBoost® at lease 1 hour before or 1 hour after you eat. 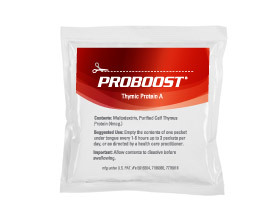 One sealed individual dose packet of ProBoost® contains 12 trillion molecules of Thymic Protein A. The powder is mildly sweet and easy to use.